Many of you will remember Grace from her participation in the Teen Chorus for our 2005 (Nordic) and 2007 (Elizabethan) shows. After graduating from Catholic University in 2012 with a music degree, specializing in Musical Theater, she returned to The Christmas Revels as an adult and has performed in the past 5 shows, from Echoes of Thrace in 2013 through last year’s Québécois production. Over the past four years she has worked in the field of arts administration for the DC Arts & Humanities Education Collaborative and then for the AFI Silver Theatre & Cultural Center in Silver Spring. 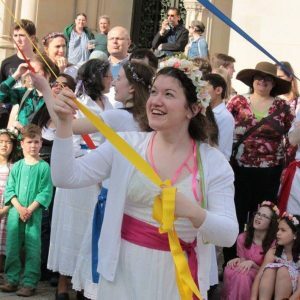 Now, I am very pleased to report that Grace has joined Washington Revels as our new Volunteer & Education Manager, filling the position vacated by Emilie Moore last November. Her first day at work was just over a month ago, and she has hit the ground running. Be sure to congratulate Grace when you see her or, better yet, email her to learn how you can get more involved as a Revels volunteer! Ross started working for Revels last May as Marketing & Programs Coordinator. He proved so adept and creative at marketing that, effective with Jo’s transition, we elevated him to full-time Marketing Director. His Programs Coordinator duties, which principally involved our 5 year-round performing Ensembles, are transitioning partly to Grace and partly elsewhere. 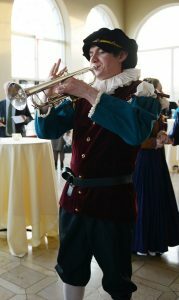 When not working for Revels, Ross continues his career as a professional trumpeter and composer. Ross co-founded and co-manages District New Music Coalition, which promotes contemporary music in the DC area and recently presented an extraordinary concert in our Revels Studio Space. If you attended our 35th Anniversary Gala, you had the fun of seeing and hearing Ross (looking a lot like this) playing trumpet fanfares throughout the evening!